Modern house with beautiful garden, heated (on request) swimming-pool, spot for al fresco dining w / BBQ, wood oven, outside fridge, bottle cooler and dinner cutlery and dishes. Large bedrooms, walking closet, nice bathrooms and a very modern and well equipped kitchen. The 6th bedroom is in a small garden house with living-room and shower-room for two. Will be an extra in case you need it. Private parking for 4 cars, although in this area the car is needed. Walking distance from the beach with a footpath through several beaches, restaurants and esplanades, that takes you to Cascais, train station, restaurants and bars. Different services to make your stay enjoyable and memorable. Can you get all the basics for your arrival, Have a chef to make and serve any meal you feel like or make it to you if you do not feel like cooking. You will have a menu to choose from. Different services to make your stay enjoyable and memorable. Can you get all the basics for your arrival, Have a chef to make and serve any meal you feel like or make it to you if you do not feel like cooking. You will have a menu to choose from. Baby-sitting service. Transfer and tour service. My large group of 12 fit comfortably in this great property. Perfect location 2 blocks from the train to Lisbon and Cascais. The outside space is awesome, including a new kitchen with seating area and pool. Isabel responded to our inquiries promptly. You were wonderful guests always so receptive and understanding. Yhe type of guests any host would like to have. All the best and thank you for staying. I stayed at this villa with 9 of my friends, to celebrate my birthday. We had an awesome time. The house is as advertised -- modern, spacious, comfortable, well equipped, with wonderful amenities for outside BBQing, dining, breakfast/lunch and lounging. It is a 5-10 minute walk to the beach, and 3-5 minute walk to the train to Lisbon. There are also many great surf areas within a 15-40 minute drive (depending on where you want to go). Isabel and her husband are terrific -- they are super nice and responsive, and were always immediately available to help out when necessary (rarely needed it, but it was great to have). They also had the kitchen stocked for us, so we could eat and drink upon arrival. I highly highly recommend having Maria Jose and her daughter come over to cook traditional Portuguese dinner, brunch or lunch for you. It is reasonably priced and positively delicious. They prepared both a dinner and a brunch for us at the large table outside by the tree. We feasted. They took care of everything, including serving dinner, cleaning up and putting everything away and in the dishwasher after we finished up. In addition to wonderful cooks, Maria Jose and her daughter are just really lovely, funny and good people. Stayed here with a group of friends for 4 nights in September and had an incredible stay. The villa is beautiful - the pictures of the website do not do it justice! The location is perfect, with amenities, the beach and the train station all really close by. Isabel was incredibly helpful and made a wonderful host. Would thoroughly recommend! Thank you for staying and leaving the house so well cared. Fabulous Home with Pool 100 meters from the train! We stayed at this gorgeous home for a week for the Nos Alive festival. Our crew of 12 were very happy with our stay and would definitely return. There is a total of 5 bedrooms, 3 bathrooms, and 1 toilet in the house, and a guest house with a shower bathroom behind. The BBQ was great addition to our stay we used it a few times. And love the big outdoor dining table with room for us all to sit around. It has the biggest lazy Susan I've ever seen! Thank you Isabel for having us we would love to come back next year! Eight of us stayed in this villa for four nights and had an excellent time - the rooms are comfortable and the pool area is great. 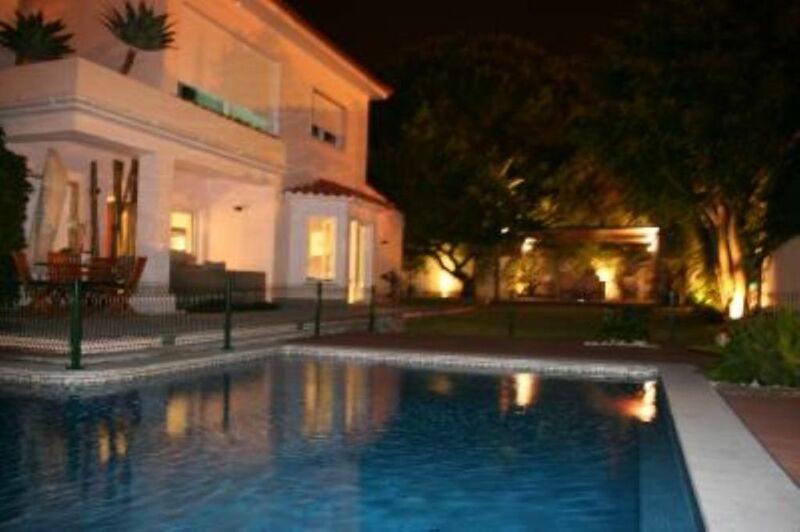 The property itself is close to Lisbon and is within walking distance to the beach. Thank you, so much, Robin. It was a pleasure to have you staying with us. I highly recommend you to every host. Very nice guests. tout etait parfait sauf la météo ! Oui c'était dommage la meteorologie, mais c'était un plaisir de vous recevoir chez nous. We have service of breakfasts, lunches and dinners, when necessary. Babysitting and maid service when requested.